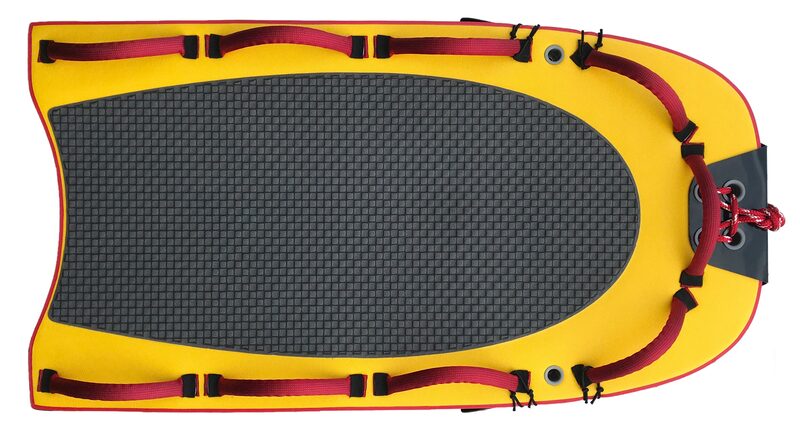 P2P Rescue Soft Tops are designed to be extremely lightweight and durable surf rescue boards. The interior construction is EPS foam core with 4 stringers running from nose-to-tail, HDPE bottom covering, multiple layered exterior skin coverage on the deck and rails. Reinforced nose and tail casings for added protection. Features full-length traction pad and 6 quick-grab high visibility red handles. 11’ Soft Top: – traditional width of 25” for added volume, balance and stability. Higher rocker profile and transitional bottom contours for maneuverability and performance. 10’ Soft Top: – designed with a narrower outline and less rocker for quicker and shorter distance response. Both models include a recessed center handle in the deck of the board for easy carrying. 7” removable plastic fin included in price. P2P Rescue Soft Top Sleds are designed to be extremely rigid for stability and feature a unique tail design for better tracking behind your PWC. The interior construction is EPS foam core with 4 stringers running from nose-to-tail, high density plastic bottom covering, multiple layered exterior skin coverage on the deck and rails. Reinforced and replaceable nose guard for side and bottom protection. High visible quick-grab solid rubber core handles running the perimeter of the board. Universal attachments on nose and side bungee stabilizers for varying PWC connections.